EnviroSAND landscape pathway product is a sand mixed with a plant glue, designed for the joints of paving stones. It’s designed to simply stay in place. It keeps the sand from washing out and keeps the weeds out! 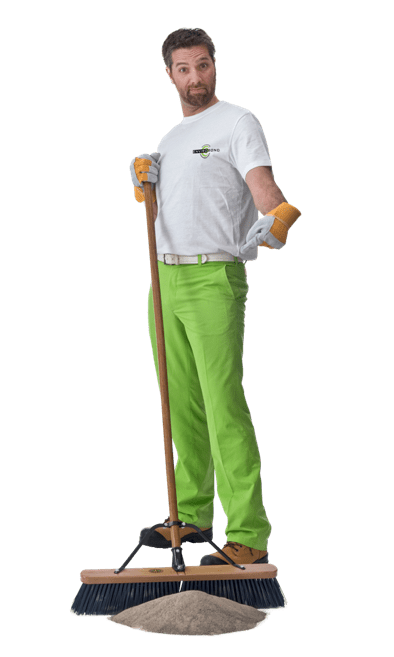 Envirobond’s installation information is both thorough and informative, providing instructions as well as tips for homeowners and contractors for our landscape pathway products. 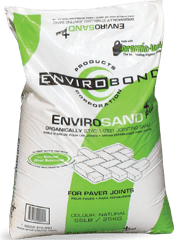 EnviroSAND is a blend of sand and our patented plant-based glue, Organic-Lock. Organic-Lock is the result of more than 10 years of scientific research, in the lab and in the field, involving researchers in the fields of agricultural, geotechnical and geological sciences. Weeds don’t grow from the bottom up. They grow from the top down when your jointing sand washes out and gets replaced by debris and organic matter. This contaminated material is a nutrient rich medium that is favorable for seeds to grow into nuisance weeds. Because our landscape pathway products resist erosion and contain a naturally elevated PH level, when properly installed you will never have to worry about weeds again! Rainfall erosion is the number one cause of joint sand loss in a segmental paving system. Our landscape pathway products form a strong gel that locks the sand particles together whenever it rains to keep the joint sand in place and effectively resist erosion. A segmental system like paving stones is designed for individual unit movement in order to function properly. Polymeric sands that become rigid after installation are prone to cracking when movement occurs. Envirobond landscape pathway products remain flexible and self-heal whenever they become wet, allowing the segmental system of pavers to function as it should. Unlike other jointing sands and pathway stabilizers, our products are made from 100% naturally occurring materials. Good for the environment and completely safe for plants, animals and people. Now available in Canada at Home Depot.